I LOVE chicken & dumplings so when I found this I added my own spin to it and lowered the fat and calories. This is the best chicken and dumplings I've ever had which is amazing since I'm never satisfied with my cooking! You can have a full cup of this hearty comfort food for only 284 calories and 3.8 grams of fat! The sodium could be reduced if homemade biscuits are used instead of the canned biscuits, but if sodium isn't a problem this is a very fast and easy way to make chicken & dumplings! 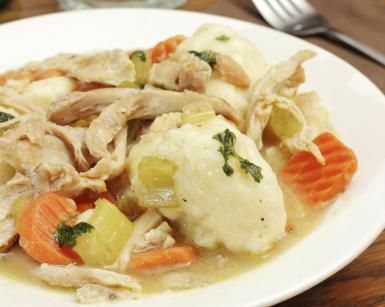 I LOVE chicken & dumplings so when I found this I added my own spin to it and lowered the fat and calories. This is the best chicken and dumplings I've ever had which is amazing since I'm never satisfied with my cooking! You can have a full cup of this hearty comfort food for only 284 calories and 3.8 grams of fat! The sodium could be reduced if homemade biscuits are used instead of the canned biscuits, but if sodium isn't a problem this is a very fast and easy way to make chicken & dumplings! *Note I noticed that some comments mentioned that the calories were incorrect on this recipe, so I double checked, and when I enter the information I still get 284 calories per 1 cup serving. That is why I added the total calories for each ingredient next to the ingredient. Makes about 10, 1 cup servings. In large pot (I use an 8qt.) Boil the chicken breasts in the chicken broth and water. Remove the chicken when done and shred with 2 forks, add back to broth. Add cream of chicken soup and milk, then bring back to boil. Cut the biscuits into smaller pieces(I use a pizza cutter) 4 or 6 per biscuit and stir gradually into boiling broth. Once all the biscuits are in the broth reduce heat and simmer about 25 minutes, stirring often. *Note to save some time before dinner you can also put the water, chicken and the chicken broth into the crockpot on low for 6 hours or so, then shred the chicken and tramsfer and the remaining broth/water into a large pot. You may need to add more broth or water if it cooks out while in the crock pot. Bring the broth to a rolling boil before adding dumplings (or you'll have a gummy mess) and once you begin adding dumplings stir very frequently. Once all dumplings are added, then cover and simmer on low. Recipe submitted by SparkPeople user STEPH2003.